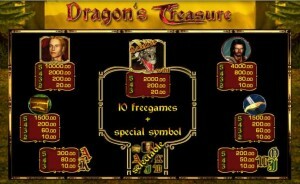 Dragon’s Treasure, is another example of Merkur’s sophisticated slot games, featuring advanced gameplay, top-of-the line computer graphics, and a variety of bonus features and alluring payouts. This new generation Merkur slot comes a long way from Merkur’s iconic, old Vegas style slots, such as Triple Chance, and Extra 10 Liner. Like all Merkur slots, Dragon’s Treasure is available exclusively on Sumaker online casino. Click here to play Dragon’s Treasure now, or read this review to find out more. Dragon’s Treasure is a 5 reel 5 payline slot. The aim of the game is to complete a winning combination of 2-5 same-symbols appearing on adjacent reels from leftmost to right across an active payline. While as a rule symbols must appear on adjacent reels, the exception is the Scatter symbol. The Dragon is a Scatter symbol. 2-5 Dragons anywhere on the reels constitute a winning combination and pay out according to the Paytable. In Dragon’s Treasure, the Dragon is also a Wild symbol (much like the joker in card games), and substitutes for all other symbols to help complete a winning combination. Dragon’s Treasure doesn’t offer “Hold” or “Nudge” options, thus spin result cannot be manipulated by the player. Player’s skill does play a role in this slot, however, when playing the “Gamble Ladder” game (see below). 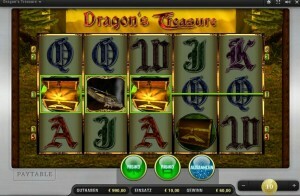 Dragon’s Treasure includes an Auto Start feature, which automatically plays the game for the selected number of spins. The number of lines in this game is fixed to 5 active lines. The bet is per spin. The player can adjust the betting level at any time, using the “+” and “-“ symbols at the bottom right side of the screen. The betting rang is €0.05-€10.00 per spin. MaxBet automatically plays the game with the fixed number of lines the maximum betting level. The total bet per spin remains visible on the screen throughout the game. Free Games – a combination of 3 or more Dragon symbols wins the player 10 free games. There is no option of winnign additional free games during a free game. The bet level in the free game is the same as in the basic game. Special expanding symbol – before the free games start, the player is asked to choose a special symbol. During the free games, when the chosen special symbol appears on one fo the reels, it expands to cover the entire reel, from top to bottom. In addition, it acts as a “scatter on line”, that is, a combination of this symbols anywhere on a betline constitutes a winning combination (not only if it appear from leftmost to right on adjacent reels). Dragon’s Treasure is not a progressive slot game. The Paytable shows the payout for each winning combination for the current bet level. A combination of five Siegfried symbols wins the player the hefty maximum jackpot of €10,000, when playing at the maximum bet level. The popularity of this game should come as no surprise. Dragon’s Treasure’s offer plenty of incentives to slots funs, including sophisticated gameplay, variety of bonus feature and generous jackpots.